Do not turn. Work with the right side facing up. Cut yarn at the end of each row. Join new yarn at the beginning of the previous row. Start: Using blue yarn, ch multiple of 6 + 1 ch. Row 1: Using blue yarn, ch 3 (counts as first dc), 2 dc in first st, 1 cluster in next 5 sts, [5 dc in next st, 1 cl in next 5 sts] repeat to end of row, 3 dc in last st.
Row 2: Join white yarn at the beginning of Row 1. 1 sc in each st of previous row. Repeat Rows 1-2 until you reach your desired size. 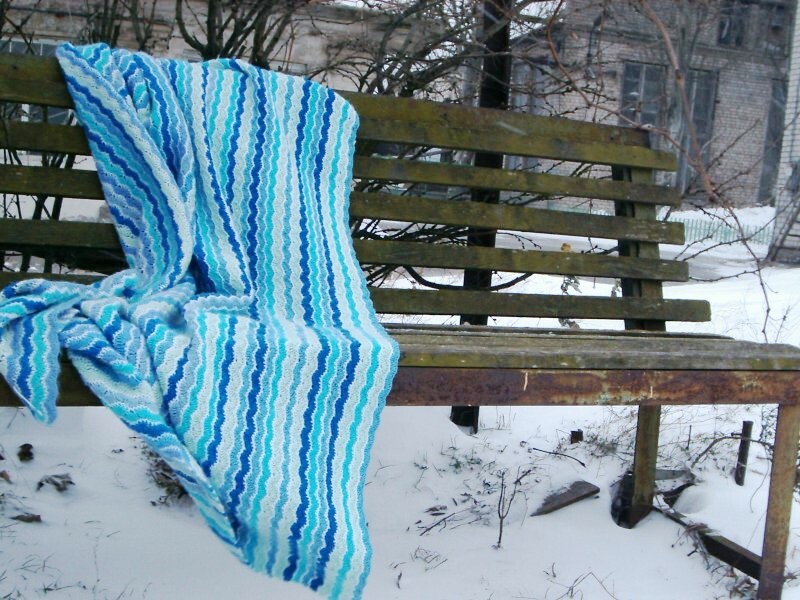 Hi, could you tell me how many shades of blue you used in this blanket? Thanks so much. there are 6 shades of blue there + white. 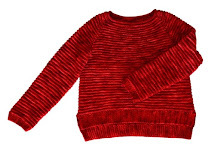 Added it to my favorites on Ravelry, a must-make. Thank you very much, glad that you like it! Sorry for the delay with replying! My gauge was about 1 PR (6 ch) = 4cm (1.5''), and the base chain has approx. 300 chains (50 PRs). 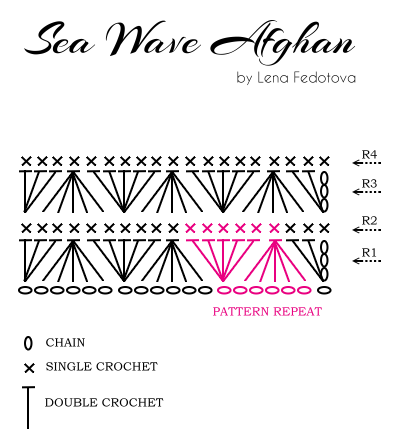 I suggest to crochet the base chain using one yarn end, and to work the first round starting from first chain and using another yarn end at the same time. This way you can extend the base chain if needed and stop crocheting it when you reach the desired length. Very nice! 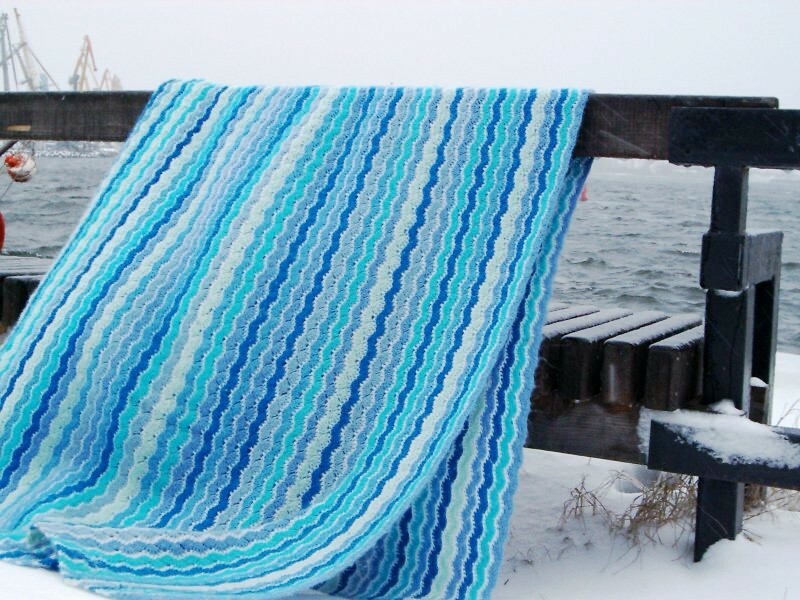 My daughter is changing her decor to a beach theme, this lovely afghan will be added! Thank you for sharing your pattern!